All set for Glastonbury today! I’ve even got a really lovely old hippy thing on, which I bought donkey’s ago, when I must have been either on a high or high back in the day, but have never dared wear before; and have even got a flower garland in my hair, which I bought here last year, but never had the nerve to put on. What is wrong with me? Why so self conscious, eh? Who gives a monkeys what I look like ?? And I remember last year seeing some real eye openers, so what the heck, hey! Let’s get into the Glasto groove for once! we headed into town via the Tor on the hill. As we climbed up and up, I suddenly heard the wonderful sounds of a saxophone wafting across on the breeze. And sure enough, when we got to the top, there he was. So we listened to this guy for a while, who lives down in a nearby village (and who incidentally, was very, very talented), had a great conversation with him, and then strolled on down the other side to town. 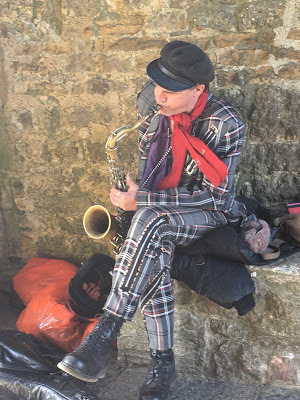 he got dressed in his spiffing, whacky suit (which he bought in San Francisco) and Doc Martens, climbed to the top of the Tor with his sax, and played it, for himself and for anybody who cared to listen. He wasn’t busking, or playing for money. No cap in sight. And if he was, he picked a really bad spot! Nope. He was playing for the love of it and because he can. Oh! to have that confidence, to wear what you want, to go where you want and do what you want – and in an unassuming, modest, beautiful way. Wendy and Steve Thorburn, for award winning fish n chips! It was super to hook up with these good people. 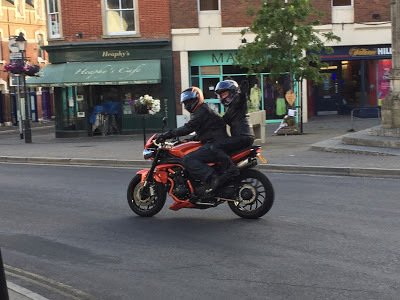 So good of them to ride over to see us! But now it’s time to catch the bus to the festival. We like being day visitors, not immersed in it completely. It’s nice to retreat, regroup and go again! 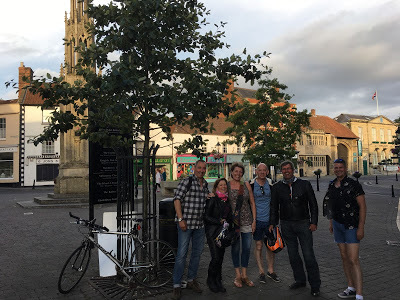 We won’t get back here before 1am, so I shall blog in the mornings and share my Glastonbury findings with you !!! Just enjoy it and soak up the atmosphere! Have a great time my son's there with 2 of his friends its their first time, they are camped near Arcadia i asked him to keep a lookout for you. Hi Barbara, well done you, on wearing what you want, and not what you think others expect you to wear. I'm exactly like you, it is very restrictive isn't it. Actually I must be far worse about these things! It makes life less happy/comfortable/relaxed than it should be. Are we getting a photo of your new outfit? Dave?, you could get your revenge for Barb posting yesterday without your knowledge!!!! Glad you had a good evening with your friends. And hope today surpasses your experience last year. Look forward to your photos and desctiption tomorrow.